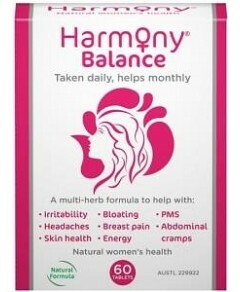 Harmony® Balance is a blend of 4 vital herbs and Vitamins D3 and B6, all well researched and selected to balance the female system. They are conventionally used to relieve the symptoms of premenstrual syndrome, menstrual cramps and to help regulate the menstrual cycle. 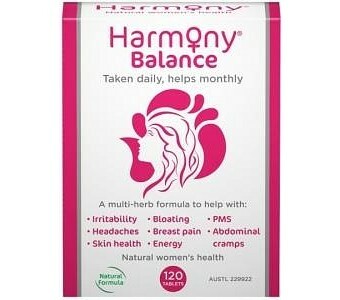 Harmony Balance may assist with: Relief from menstrual cramps Relief from Balance symptoms before and during your period Creating a calming and stabilising effect to relieve mood irregularities Building energy and wellbeing for ongoing nourishment and improved health Ingredients: Each tablet contains extracts equivalent to the dried herbs: Vitex agnus-castus fruit (Chaste Tree): 175mg Angelica polymorpha root (Dong Quai): 2g Paeonia lactiflora root (Peony): 2g Bupleurum falcatum root: 1g Vitamin D3 150IU (Cholecalciferol): 3.75ug Vitamin B6 (from Pyridoxine hydrochloride): 25mg Also including naturally derived excipients; Calcium hydrogen phosphate, Cellulose – microcrystalline, Croscarmellose sodium, Hypromellose, Silica – colloidal anhydrous, Magnesium stearate, Chlorophyllin – copper complex, Carnauba wax. Tablet coating proprietary ingredient PI 4029. Harmony Balance does not contain Black cohosh (Cimicifuga racemosa or Actaea racemosa) Warning: Always read the label and use only as directed. If symptoms persist, consult your healthcare professional. Harmony Balance is manufactured to the highest pharmaceutical standards in government licensed premises. Only the best quality ingredients are used and are rigorously scientifically tested for identification, quality and potency.